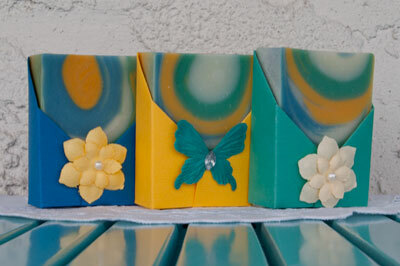 This soap packaging tutorial is the result of numerous requests for instructions on how to wrap soap like the ones in Nikki Hoefer's picture that she has graciously allowed me to post on my site. 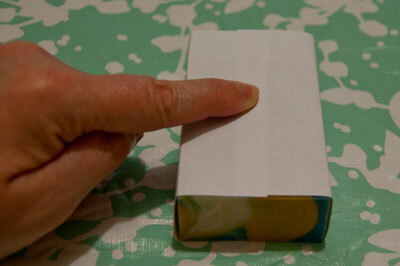 Begin this soap packing tutorial by measuring your soap bar. First measure the distance from top to bottom and add 3/4". 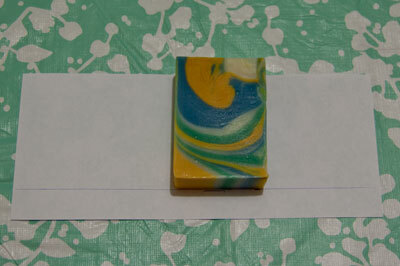 Then measure the distance around your soap and again add 3/4". 2 x (Thickness + Width) + 3/4"
For example...my bars are 3" tall by 2" wide by 1" thick. My first measurement will be 3 and 3/4". My second measurement will be 2 x ( 2" + 1") + 3/4" = 6 and 3/4". Cut out a piece of paper that equals your measurements. I cut out a paper that was 3 and 3/4" by 6 and 3/4". I've drawn a line at the 3/4" mark so you can see that it lines up with the bottom of the bar. 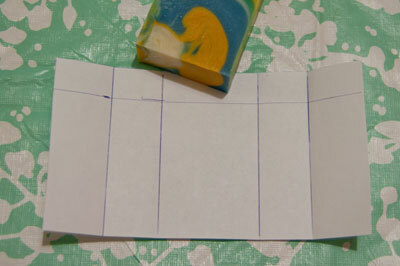 Wrap the paper around the soap and crease the edges. Fold the paper on the creases to make crisp edges. I've marked the creases in pen so you can see. 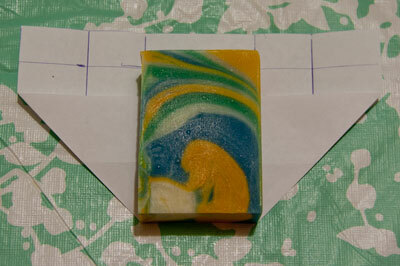 Fold the paper down the edge of the soap to form wings. Wrap the wings around the soap and fasten with a bit of tape. 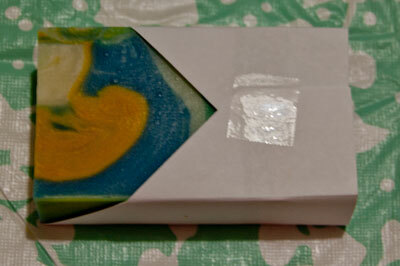 Fold the paper around the bottom of the soap like you would a parcel or present. Tape the bottom and add on your decorative embellishment. If you are selling your soap, you may want to add a label to the back of the packaging listing your ingredients, business name and contact information. 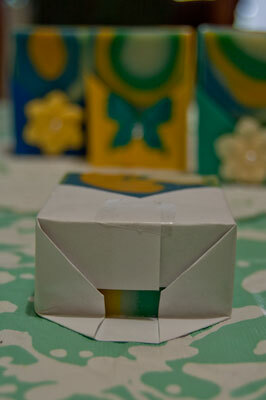 As you can see, this soap packaging tutorial is really easy and once you get going, doesn't take much time at all. The process takes a few seconds longer to do than plain band labels but you won't get that sloppy label look as the soap shrinks since the pockets retain their shape, especially if you make them from card stock...and they are much more attractive! 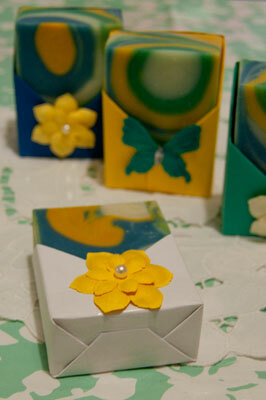 Return to top of Soap Packaging Tutorial page.